She inspires people to find hope and faith through action. 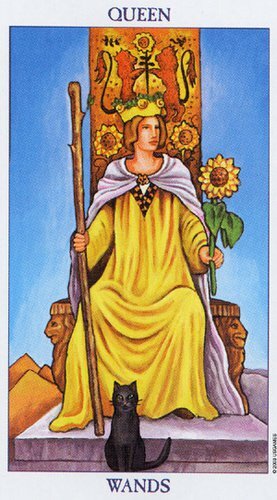 With a wand in one hand ready for action, and a sunflower in the other, symbolic of the sun as a ray of hope. The queen who sits upon this throne conjures thoughts of Joan of Arc. The people of France were feeling defeated after years of losses in battle. Their moral was at an all-time low when Joan of Arc claimed that the voice of God was instructing her to take charge of her country’s army and lead it to victory. Joan of Arc believed that she was divinely guided to lead her people out of despair and into victory in the ongoing war. She claimed that the voices of angels and saints told her to deliver her country from the invading English. She was also told that she must lead Charles VII to his coronation. After gaining the approval and authority to do so, she led her army and broke the siege of Orleans in only three days of fighting. She became known as the beloved maid of Orleans. Joan of Arc crowned Charles VII King of France on July 17, 1429. In the great Cathedral of Reims, Joan fulfilled the central part of her mission when he was crowned King. The Queen of Wands card also depicts a black cat sitting at the feet of her throne. Considering that the black cat is often seen as a sign of witchcraft, the symbolism in this card further reminds us that Joan of Arc’s fate would be sealed as an accused heretic. She was captured by Burgundian soldiers and sold to the English for ten thousand gold francs. Joan of Arc was put on trial for heresy and burned to death on May 30, 1431. A sad ending to a heroine who delivered her people from the depths of despair towards victory. However, she fulfilled her prophesy, and restored the dignity and faith of her people. Perhaps we should seek inspiration too so that we can reclaim our own hope and faith in order to take action in our lives. A little bit of inspiration can go a long way towards finding our purpose again so that we can pursue our dreams and ambitions. Remembering that the policy of paying if forward as we try to inspire others with our actions has a rippling effect that could have far-reaching positive results for those who are touched by our contributions, no matter how humble they may be.